Leave No Trace is a moral code and daily practice for any thru hiker, section hiker, or day hiker. It teaches us to respect the ground we walk on, the plants that grow from it, the animals who share our space, and the other hikers. Why is it that, as soon as we return to “the real world” we forget about the ways we lived kindly withe the natural world around us? We buy pre-packaged food and throw all the wrappers and scraps into the trash, we buy a iced coffee in a plastic cup and chuck it in the nearest trash can when we are done, we buy the cheapest things we can with no thought to how they came to be there or how they were made. While I was on the Appalachian Trail, Leave No Trace was an ethos that I did my best to follow every day. Over the past year or so, I’ve started to think more about how Leave No Trace principles can extend to my off-trail life as well. What is the impact I have on this planet? How can I tread more lightly on this place we call home? Not all of us are able to live trail life, or a more minimalist, nomadic lifestyle, for the entire year. When we get off-trail and go home to our apartment or house (duplex, in my case), how do we bring the lessons of the trail back home with us? A goal that is ethical, economical, efficient and visionary, to guide people in changing their lifestyles and practices to emulate sustainable natural cycles, where all discarded materials are designed to become resources for others to use. Zero Waste means designing and managing products and processes to systematically avoid and eliminate the volume and toxicity of waste and materials, conserve and recover all resources, and not burn or bury them. Implementing Zero Waste will eliminate all discharges to land, water or air that are a threat to planetary, human, animal or plant health. I believe that, as people who love the trail – love a part of the natural world – we have a responsibility to see that it continues to exist and thrive for future years and generations. We have a responsibility to check and examine our own consumption and disposal habits and practices. We also have a responsibility to bring the power of our community to bear on the forces that would seek to undermine, destroy, or disregard these natural spaces that we care about. Set goals for yourself. Can’t put plants in the ground because you live in an apartment? Try setting a goal to grow a few herbs on your kitchen countertop. Do you clean your house (if not, gross.)? Think about turning your last cleaning spray bottle into a reusable bottle. Mix up your own cleaning solution, and get to work! Set goals for 1 month, 1 year, and 5 years. Track your progress! Engage in your community. Are you passionate about environmental policy? Write a letter to your representatives, or research the grassroots movements are happening in your area. Are you interested in eating local? Buy your produce at a farmer’s market or go visit a farm! Advocate for Zero Waste and sustainable practices. Talk about this with your friends and family. Start a meetup! Research and share blog posts and recipes (you could start with this one!). Be conscientious and deliberate. Research the companies and products that you purchase. Support companies and organizations that are transparent, sustainable, and considerate with their sourcing and production practices. It seems like a daunting task to climb these mountains and implement these changes in my life, but as I well know, all hikes have to start with a first step. My first baby steps down this journey are to be more deliberate about the cleaning products I use, how and where I get my food, and attempting a garden of my own. I find cleaning to be a meditative and satisfying activity (I’m probably the only one), but when looking at the amount of paper towels, plastic bottles of cleaning products, and Swiffer sheets that I go through, I cringe. Time to make a change. Pictured here with my prayer plant is homemade all-purpose cleanser and homemade air freshener. Any aspiring zero-waster should invest in a good reusable spray bottle (or multiple!). A great mixture is 50/50 water and white vinegar. 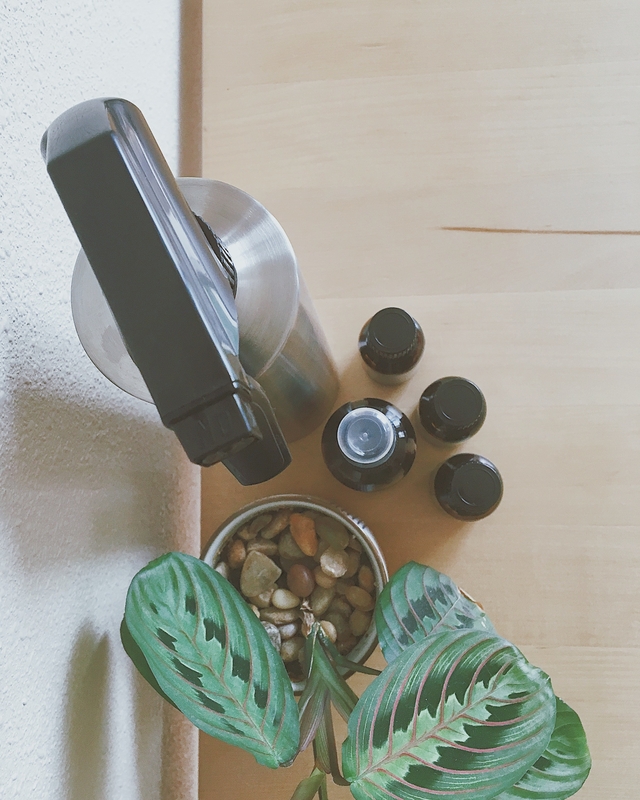 I’ve added drops of essential oil – rosemary and lemon – because I’m a sucker for good-smelling cleaners. 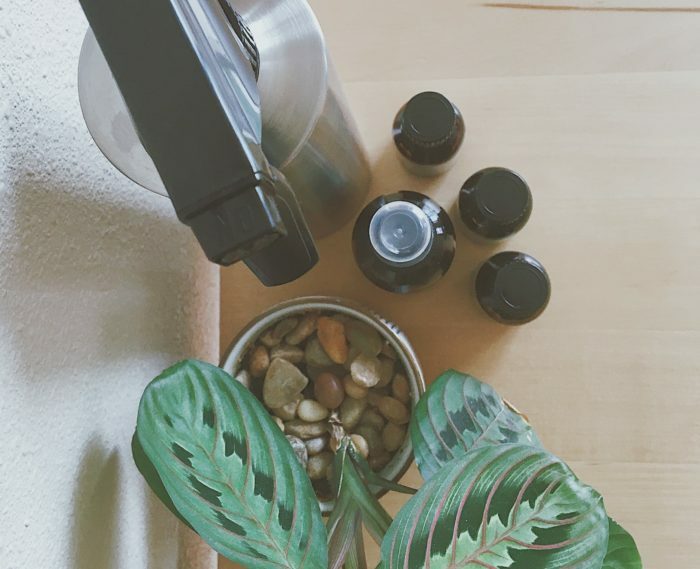 You can also make DIY air fresheners using essential oils. I borrowed a recipe from Jill at The Prairie Homestead. Combine 3/4 cup of water with 2 tbsp of alcohol (vodka, rubbing alcohol, and vanilla extract all work, according to Jill. I used rubbing alcohol because it’s what I had on hand) and add your desired essential oil scents. I used lavender, rosemary, and lemon, for a refreshing and clean smell. Another change I’ve made is to frequent my local farmer’s market more often. By supporting local growers, I can rest easy knowing what processes, techniques, and chemicals they’ve used to grow their food. One of the seven Leave No Trace principles is to Plan Ahead and Prepare. Leave No Trace adds a sub-component of that principle by asking hikers to repackage food to minimize waste. This idea can easily be applied to off-trail life. 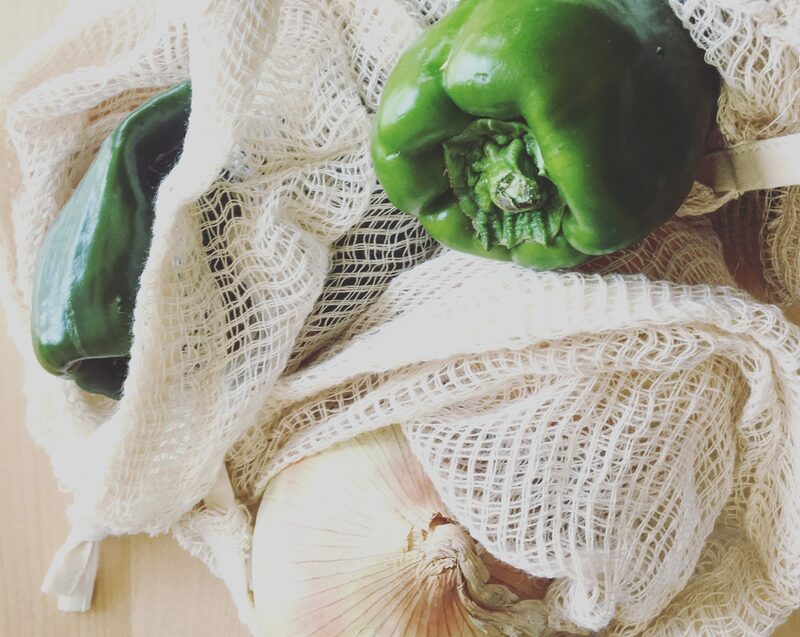 Whenever you go grocery shopping, whether it’s at your local farmer’s market or a big box store, remember to minimize the packaging waste of the food you are purchasing. I’ve extended the zero waste impact of my shopping by using reusable bags. We’re all used to those flimsy plastic bags at grocery stores. What are they good for once you get home? I’ve used them in the past to pick up dog poop or line small trash cans, but that’s really their only use, and then they go in the trash. Why not invest $10 and get some cotton mesh bags that you can reuse again and again? There are a variety of options out there, but I bought these on Amazon. Reusable grocery bags are even more common than reusable produce bags. Your grocery store probably even sells them. Find yourself a couple of tote bags, and don’t let the cashier ever give you a plastic bag again! In addition to having your own bags, consider finding a store where you can buy in bulk. Why buy pre-packaged goods when you could buy exactly how much you need for the next day, week, month, or year – without the excess packaging. 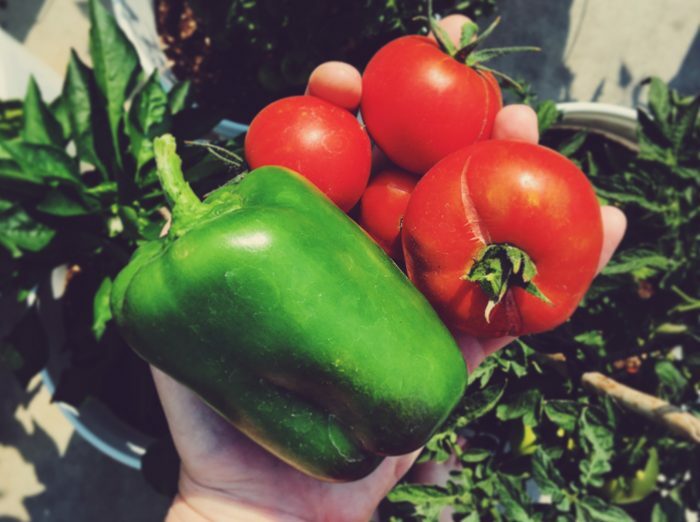 Another way to minimize your waste impact is to grow your own food. This sounds daunting, but it’s really not! I was surprised how easy this was to do, even with my lack of a green thumb. If I can do it, you can too! This season, I attempted to grow a container garden. We gathered some 5-gallon buckets, drilled a few holes in the bottom, and planted some seedlings purchased from our local nursery. We have 5 tomato plants, a few okra plants, 4 bell pepper plants (all varieties), herbs, and some strawberries (these didn’t fare as well as the rest). Next year, I’ll probably try a few more varieties of vegetables, and I might even be a little more scientific about it by looking up a growing schedule for my region. I also hope to invest in canning supplies so that I can store my vegetables for less bountiful months. I haven’t yet built my own compost pile, but most cities have opportunities for composting. Some have businesses that offer composting services (think of it as a utility, like garbage, water, or electric), some have local farmers who would be happy to add your food scraps to their piles, and some offer a variety of composting as a part of standard yard waste disposal. Another of the seven Leave No Trace principles is to Dispose of Waste Properly. On the trail, this includes not leaving your food scraps around for people or animals to find. Why shouldn’t we continue this practice off-trail? Landfills keep trash for years, and organic matter can get buried and sealed under non-organic trash. This creates a vacuum where the organic matter breaks down anaerobically and creates methane, which is a very environmentally damaging greenhouse gas. If you want your favorite trail to be here in the future, compost! What are you doing to live more in the spirit of Leave No Trace when you are off-trail? Let me know in the comments! who gets to go fіrst.